Jaitley countered the claims of flaws in India's economic data by stating that the same data is accepted by credible international institutions like the International Monetary Fund and the World Bank. Arun Jaitley once again debunked the claims of jobless growth of Indian economy. 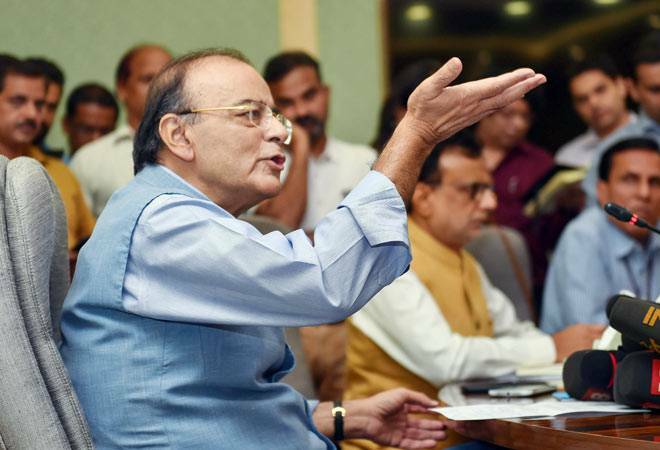 Finance Minister Arun Jaitley has dismissed the concerns raised by some economists over the integrity of statistical organisation and economic data of the country. Jaitley said the campaign started by them is politically motivated. Last week, 108 economists and social scientists had called for restoration of institutional independence and integrity of statistical organisations in India. The appeal came in the backdrop of controversy over revision of GDP numbers and withholding employment data by the NSSO. "A few days back, 108 so-called economists issued a statement questioning the veracity of Indian data. I analysed the credentials of all 108 and found out that 70 per cent of those are compulsive contrarians, critics of the government, who have signed multiple memorandums against this government in the last five years. Most of these memorandums are on the issue of politics and not economy," Arun Jaitley said in a video posted on his Twitter handle. Jaitley countered the claims of flaws in India's economic data by stating that the same data is accepted by credible international institutions like the International Monetary Fund and the World Bank. He also refuted claims of jobless growth in Indian economy. Jaitley claimed that that India's infrastructure growth has been the fastest, which has created jobs. He referred to the work being done in highway construction, electrification, housing, sanitation, and urban infrastructure, growth in manufacturing, especially electronic manufacturing in his claim. "There is a fake campaign going on that all this growth doesn't create job," Jaitley said. Yesterday, 131 Chartered Accountants (CAs) had come out with a joint statement to counter the allegations raised by the economists. The group of CAs said the earlier appeal was "politically motivated and baseless" and most "independent professionals have no doubt about the remarkable progress India has achieved in the last five years". The signatories of the new list include eight former presidents of the Institute of Chartered Accountants of India (ICAI), dozens of ICAI council members, independent practitioners with CA firms, entrepreneurs like T V Mohandas Pai, chairman, Manipal Group, and professionals in the field of finance, banking, among others.